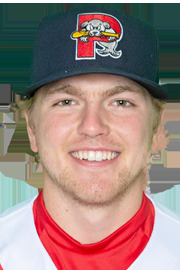 Right-handed pitcher Durbin Feltman was the Red Sox third-round pick in the 2018 draft after a successful college career as the closer for Texas Christian University. Feltman signed quickly for the full slot value of $559,000, and with injuries to the two players the club selected ahead of him, Triston Casas and Nick Decker, Feltman has had a chance to really stand out in his pro debut. Feltman has already advanced to Salem after making brief stops in Lowell and Greenville. With Lowell, he threw four innings, allowing no baserunners while striking out seven. With Greenville, he threw seven innings, allowing six hits, a walk, and a pair of runs while striking out 14. With Salem he has made two appearances thus far, striking out two, allowing one hit and walking two over two innings. He’s the first Red Sox draftee since Craig Hansen to advance past Greenville in their draft year and has established himself as the top pure relief prospect in the Red Sox system. Feltman is an undersized right-hander with a filled-out frame. Listed at 5-foot-11, 190 pounds, he doesn’t have your prototypical pitcher’s build, but in a relief role, his lack of size isn’t much of a concern. Feltman’s delivery also screams relief-only, as it is maximum-effort with a lightning-quick arm. Feltman starts on the third base side of the rubber and throws directly over the top. He doesn’t use a wind-up and has a quick, jerky delivery during which he hides the ball well before exploding towards the plate. This deception makes him tough to pick up and allows his fastball to play up even more, as it seemingly jumps on hitters. Feltman’s fastball velocity has been down a tick from where it was in college, but that is to be expected given his time off after the draft and drastic increase in his workload after throwing no more than 34 2/3 innings in a season in college. In a recent look in his final appearance with Lowell, Feltman sat 94-96 mph with every pitch he threw. In college, Feltman reportedly touched 99 mph, and it wouldn’t be a surprise to see that velocity come back next year after a full off-season in a professional strength and conditioning program. In addition to plus-plus velocity, Feltman’s fastball also shows plus life and he has above-average control of the pitch already. His command is still developing, but he has flashed the ability to locate the pitch both on the corners and up and down in the strike zone. Even with developing command, he’ll be able to succeed, especially against low minors hitters even when he misses location, as his stuff will overwhelm them. Feltman’s fastball projects as a plus-plus pitch, capable of missing bats at the highest level even as soon as next year. Feltman’s primary secondary pitch is his slider, which also projects as at least a plus pitch. The pitch is a true power breaking ball, thrown at 84-86 mph with hard, late break. The pitch shows depth and he has advanced feel for it, capable of throwing it in the zone or burying it down and out of the zone when looking to get a swinging strike. Already he has a gotten a ridiculous number of swinging strikes against the pitch, including four out of the six he elicited in the outing scouted. The pitch has the look of a true major league out pitch and, again, the potential to miss bats at the highest level. Feltman will also throw a curveball on occasion, but he didn’t use the pitch in the outing scouted and he throws the pitch rarely. Though Feltman has been pushed to Salem already, it is unlikely he reaches the big leagues this year. His usage patterns don’t suggest that he is getting ramped up for such a role, as he has only thrown on fewer than three days’ rest on one occasion, which coincidently is the only outing during which he has given up multiple runs this year. Feltman made four appearances with Lowell, seven with Greenville, and has one so far with Salem. After another four or five appearances with Salem, assuming the same success he’s had so far, it wouldn’t be a surprise to see him head up to Portland to end the season. Should his success continue there and into Spring Training next year, a non-roster invitation to major league camp with an eye towards making his major league debut sometime next season is definitely not out of the question and perhaps even likely.